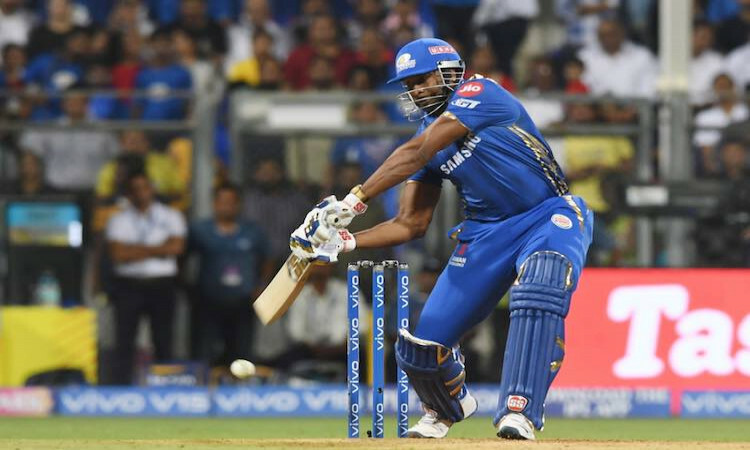 Mumbai, April 3 - Despite a slow start, it was Hardik Pandya and Keiron Pollard's quick-fire play, which propelled Mumbai Indians to 170/5 in an Indian Premier League (IPL) match with Chennai Super Kings at the Wankhede Stadium, here on Wednesday. Earlier, Suryakumar Yadav (59) and Krunal Pandya (42) made valuable contributions to the team's score. Rohit Sharma and Suryakumar Yadav then tried to repair the damage, adding 37 runs for the second wicket. But Ravindra Jadeja cut short the former's stay, dismissing him on 13 as Mumbai were 45/2 in the eighth over. With the addition of just five runs in the scorecard, Imran Tahir intensified Mumbai's troubles by sending Yuvraj Singh back to hut at 4. Suryakumar and Krunal Pandya (42 off 32) then showed some resistance and stitched a 62-run partnership. Mohit Sharma finally broke the partnership by sending almost dangerous looking Krunal back in the 17th over. Krunal's knock was laced with five boundaries and a six. While trying to shift gears and accelerate the run-rate, Suryakumar tried to clear the fence off a Dwayne Bravo delivery, but ended up giving a catch to Jadeja at the long-on. It left the hosts at 125/5 in 17.6 overs. Suryakumar's fighting innings contained eight boundaries and one hit into the stands. Keiron Pollard (17 off 7) and Hardik Pandya showed some quick hands towards the end as they hammered Bravo for 29 runs in the final over to help Mumbai reach 170/5 in the allotted 20 overs.